I came of age just after the “first wave” of feminism. Or did I? I was of high school age in the 70s – that post-60s generation who benefited greatly from the feminists who came before us and garnered us rights related to credit, breaking certain glass ceilings (but not all), and more. But as I grew older, I came to realize that I was wholly ignorant of a great number of women who fought really hard, ugly fights to gain rights that, even back “in the day,” I took for granted . . . for example, the right to vote. It took a lot of discussions and books and movies to make me aware that Susan B. Anthony and Elizabeth Cady Stanton were NOT the only feminists who made the difference when it came to my sense of entitlement about voting when I came “of age” to vote in the 1980 presidential election. I worked on my first political campaign (for George McGovern) at the tender age of 13. And I was crushed when Nixon won that election evening. And (as was often the case in my family), my mother sent my older brother down the street to Baskin Robbins to get ice cream for everyone – that was our comfort food and comfort process for everything from earthquakes to lost roles in auditions to minor/major car accidents to, yes, lost political campaigns. And I ate my Pineapple Ice through tears . . . and we watched the rest of the election results roll in (although the election was called long before the CA polls even closed). To this day, I’m not sure whether my father really voted for Shirley Chisholm in the primaries of that election or if he just told me he did to curry my feminist favor. But the fact that he cared enough to impress me still touches my heart – I don’t think I really want to know the truth. 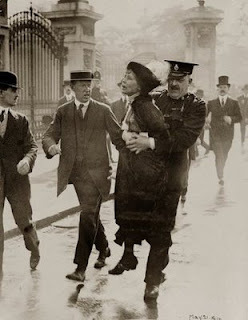 Flash forward 20+ years to me as the parent of a 16 year-old young woman in 2004 and the HBO premiere of “Iron Jawed Angels.” By then, I’d read and discussed and learned enough to know that women’s suffrage was NOT some simplistic sweet story of how Susan B. Anthony refused to pay a fine in 1872 when she cast a vote . . . instead, decades went by as women continued to organize, campaign, complain, argue amongst themselves about best tactics, and ultimately split on whether to take a more moderate or activist approach. And the upshot is . . . I ADORE Alice Paul. I ADORE Lucy Burns. I ADORE Ruza Wenclawska and every other woman who got tired of being polite . . . of being patient . . . of “waiting their turn.” I made my then-16 year old daughter watch this show - twice. Because I wanted her to know that sometimes, you have to take a stand. You have to be impolite. You have to say, “ENOUGH.” I wept as I relived the protesting that engendered spitting and angry vitriol and violence, the social ostracism that women endured when everyone wanted them to again say, "Our time will come . . . eventually," the force-feeding and imprisonment . . . and instead, they said, "Our time is NOW." Ladies (and Gentlemen), it is my firm belief that it is beyond time to say, “ENOUGH.” The time is NOW. I hope you join us in Washington, D.C. on August 18., 2012 to say, “ENOUGH!” to well over 1,000 pieces of anti-women legislation. We are in crisis in America – the economy, jobs, housing and more. To take this period of economic crisis and turn it on women and our reproductive, economic, familial, and a whole range of other RIGHTS is unacceptable.